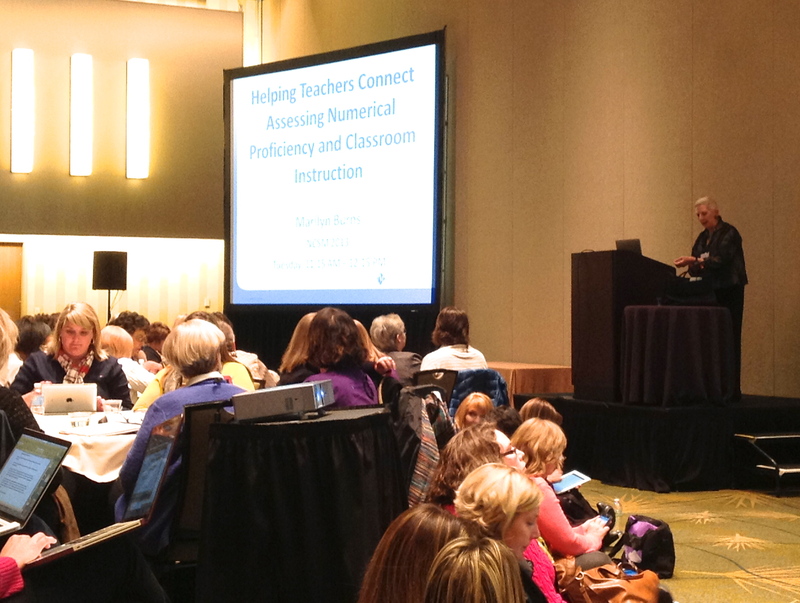 When Dan Meyer tweeted for volunteers to recap sessions at NCTM, I thought it was such a great idea! What a wonderful opportunity for educators to learn from wherever they are! Marilyn opened the session with a brief description of her Math Reasoning Inventory (MRI), “MRI is an online formative assessment tool designed to make teachers’ classroom instruction more effective. The MRI questions focus on number and operations and are based on content from the Common Core State Standards for Mathematics prior to sixth grade. They are questions that we expect…and hope…all middle school students to answer successfully.” From there, she outlined four uses of the MRI (or any MRI-type student interviews) to help teachers connect assessment to instruction: embed MRI clips into classroom instruction, use the interview questions to develop properties of operations, analyze student errors in reasoning and use interview answers to inform classroom instruction. Marilyn described a number talk she had recently done with a group of 4th graders. She posted 99 + 17 on the screen and asked audience members to share strategies with people seated around them. After a few moments, the audience reconvened and Marilyn shared example reasonings from her 4th graders. She explained that during her number talk with the 4th grade students, she recorded the students’ reasonings on the board with their name beside it and offered other students the opportunity to agree, disagree, or share another way of solving the problem. After the students had given all of their solutions, she showed them MRI video clips of 5th graders solving the same problem. After each clip, Marilyn had the 4th graders revisit their responses and relate the video solution to the recorded class solutions. I thought this was an amazing way for students to make connections between strategies, when not “worded” the same way. For example if someone had added 100 + 20 and then taken away 4 to arrive at 116, it is a compensation strategy like example 1 above, however may look different numerically. This difference in appearance could lead to mathematically rich conversations in determining relationships of strategies among the students. The next problem Marilyn posed to the audience was 15 x 12. She asked audience members to share strategies with the people seated around them. After a few moments, the audience reconvened and Marilyn shared example reasonings of the problem on the board. We watched videos of students solving the problem and discussed the distributive property of multiplication over addition. Typically students decompose numbers by tens and ones, however when we do something like 12 x 12 to start, we are not using that same reasoning. Marilyn went on to discuss that we tend to look at the distributive property as multiplication over addition, however it could be multiplication over subtraction as well. These discussions, when used in the classroom, help develop the students understandings of the property of operations and promote the standards of mathematical practice. Marilyn showed video of a student solving 15 x 12 using the standard algorithm. I have to stop for just one second to say that I cringed a bit at the use of the term “standard algorithm.” While I understand most teachers use it to identify “traditional” multiplication, I would argue that any algorithm could be standard if worked efficiently by a student. Ok, back to the presentation. The student arrived at the correct answer, however when explaining her process, it is clear she lacked numerical reasoning when computing mentally. Marilyn further explains that the algorithm is not a concern on an individual problem, however IS a problem when it is the student’s only strategy. She made a connection between properties of operations with whole numbers and decimals by posing the question, 1.5 x 20. We watched student videos and discussed the use of the distributive property in this problem vs the use of the associative property. Marilyn revisited the problem 15 x 12, however this time asked the audience to guess the top two incorrect responses students gave for this question. The general consensus of the audience was 110 (10 x 10 + 5 x 2). The second most common was 30, we were all a bit curious where that came from, including Marilyn. My guess is the student set up the problem vertically, multiplied 5 x 2, carried the one and added 1 + 1 + 1 to get a 3 in the tens place. Just a guess though. She went on to tell us that 24% of the 6th grade students got this problem incorrect. Scary. The problem 12.6 x 10 was posed and we went through the same steps of guessing the two incorrect responses. 39% of the interviewed 6th graders answered this incorrectly and the two most frequent incorrect responses where 120.6 and 12.6. We watched a couple videos of the students’ incorrect reasonings. The most interesting clip for this problem was a student who answered the question as “120 and 30 fifths.” The student had multiplied 12 x 10 to arrive at the 120, but then wrote 6/10 as 3/5 and multiplied by 10 to arrived at 30/5. Marilyn pointed out that while not conventional, it is the distributive property and what an excellent opportunity it would be to ask students if that answer is correct. Knowing the student errors that occur on these problems can help guide your classroom instruction. It was interesting to me that the majority of the teachers in the room could name the most frequent incorrect responses and yet these mistakes are still occurring. If we know they happen, what are we doing to stop them from happening? With a few technical difficulties in the beginning, we were running about 5 minutes behind schedule. That didn’t leave much time for fractions, however Marilyn briefly discussed comparing fractions such as 3/8 and 9/16. She stressed the importance of having students explain the “because” part of the answer. She said because of the easy equivalence of 16ths with 3/8 and 9/16, she suggested then asking 3/8 or 5/6 to elicit different solution pathways. Marilyn’s discussion and examples of the Math Reasoning Inventory demonstrated the importance of teachers listening to students and using those conversations to improve the connection-making and relationship-building in classroom instruction. If you are interested in more math recaps, visit Dan’s recap site! Awesome stuff! This entry was posted in Math, Professional Development, Uncategorized and tagged Marilyn Burns, Math Recap, NCSM on April 20, 2013 by mathmindsblog.